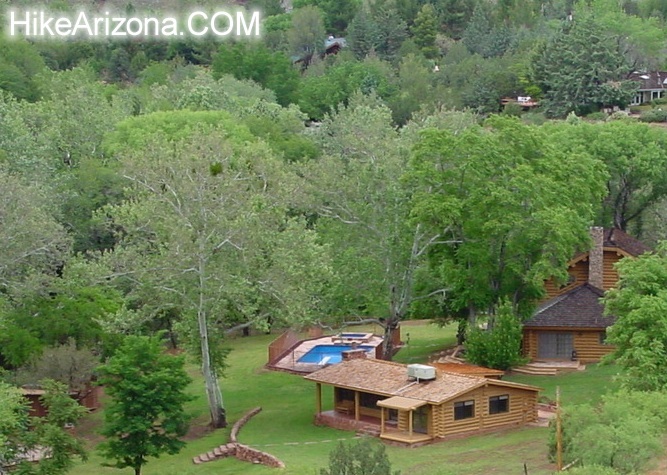 Here's a short and sweet little Sedona excursion. 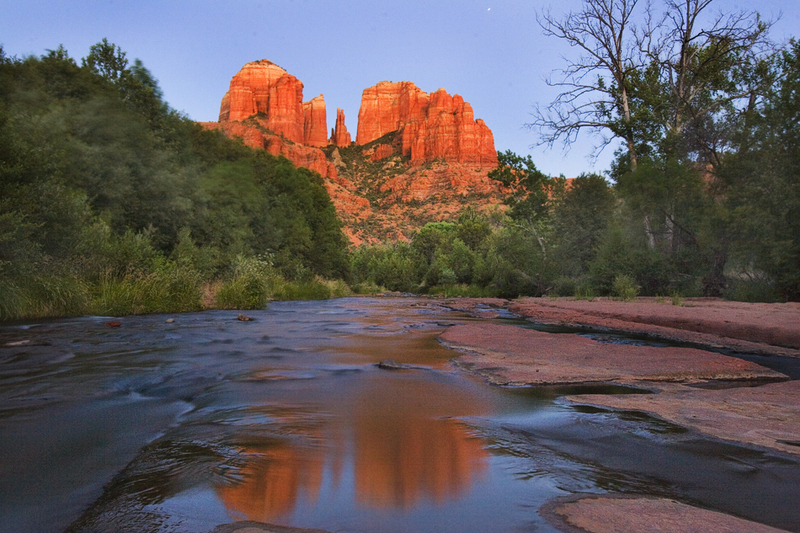 Surely you've seen photos on books and magazines of Oak Creek as it seems to flow right out of Cathedral Rock. This is the area known as Red Rock Crossing, a huge red rock sand bar crossing the creek. I suggest checking it out before the NFS or the state develops the area into a pay-per-use park. Also, don't come expecting the place to yourself. 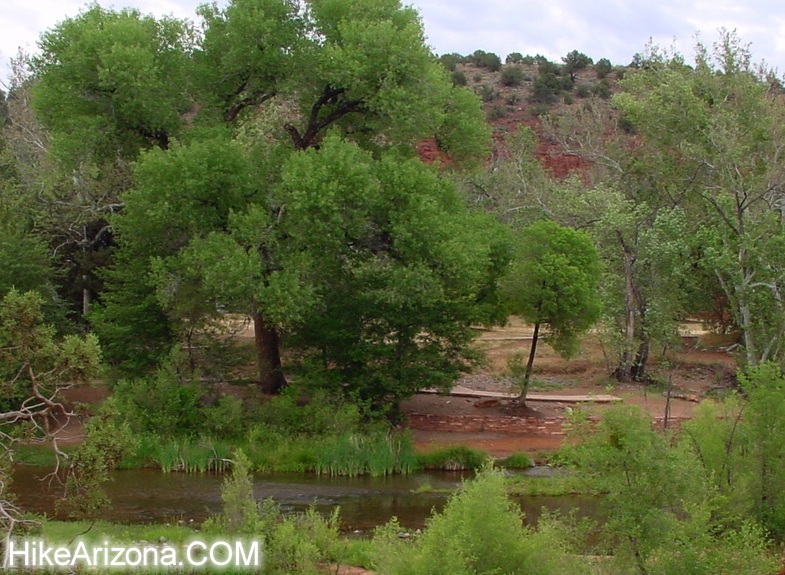 From the parking area cross Verde Valley Road and pick up the Baldwin Trail on the other side. It looks a little bleak in the beginning. Rest assured a short trek will change your mind. Soon trees surround you and a ledge ramps you down a ways. Next the area opens up into big grassy field. The trail is road width all the sudden. The quickest access to Red Rock Crossing is dashing over to the creek from this area. (uh, that's left) You might want to check out some nice areas ahead since this isn't much of a hike. 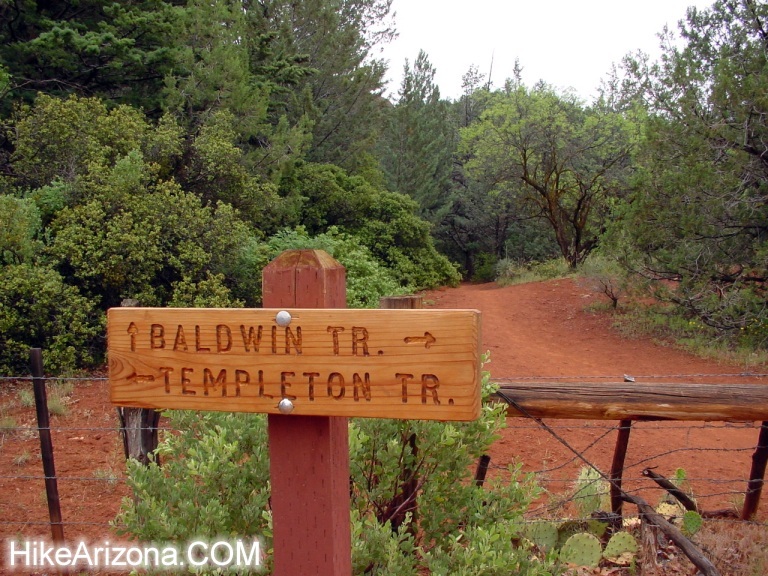 Continuing on to the Templeton junction. A right takes you counter clockwise around Cathedral Rock. This is a popular mountain biking loop. 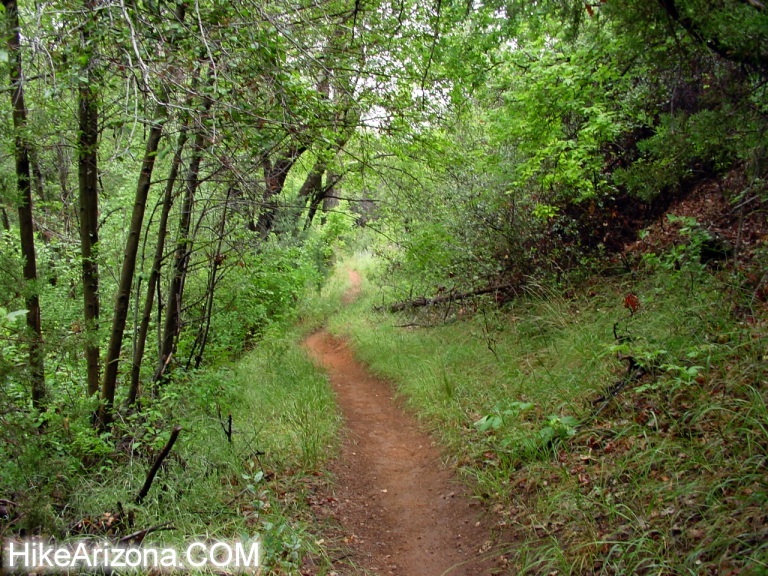 In fact it's one of the few good mountain biking spots in Sedona. Most of the trails fall into some kind of wilderness where bikes aren't allowed. Take one of the two forks heading on straight/left-ish, both hook up in a while. If you've played around on the east side of Cathedral Rock you might be surprised. This northwest side here features Oak Creek in stunning fashion and lush surroundings. 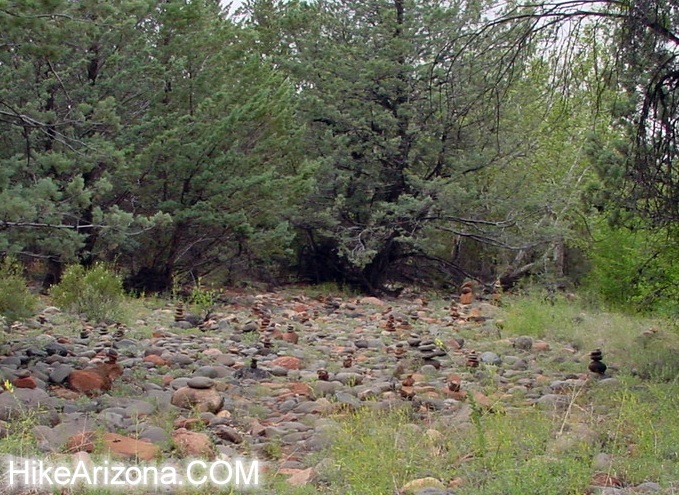 Especially interesting is where the creek bends around a rocky bank. 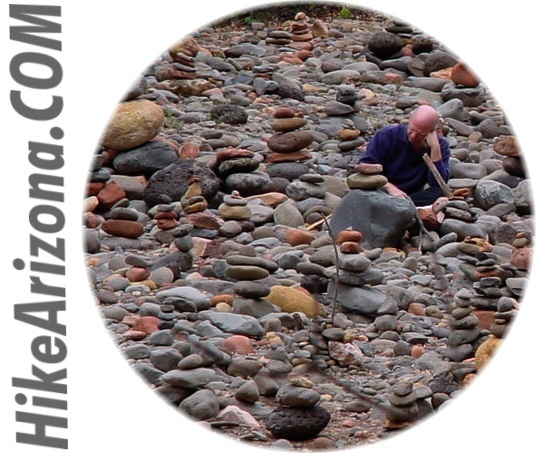 Just before the bend is a stone beach where meditating isn't all that uncommon. Check out the rock piles. Since I'm not a "stoner" I moved on. 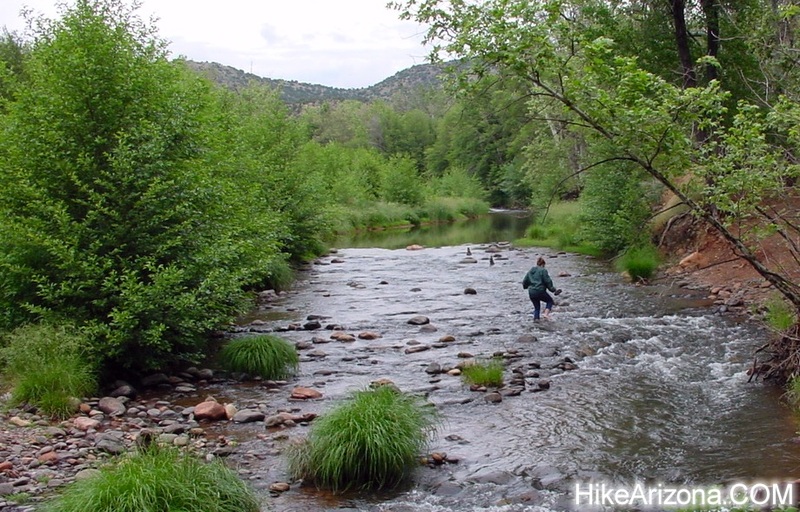 Take the trail heading away from the creek here and you'll undergo a little West Fork atmosphere. This leads to some switchbacks leading to the north end of Cathedral Rock. Unless you're completing a Cathedral Rock loop don't bother going up. The views aren't anything to write home about. Especially the view of the most perfect looking little cabin house which makes you wanna hurl. Sorry, but my father is a retired architect. He'd be babbling opportunity lost. Head back down the West Fork corridor. Back at the Templeton junction head on over to the creek. You'll have to work your way down stream to Red Rock Crossing. Along the way you might encounter another rock pile field. Red Rock Crossing is pretty obvious when you reach the area. Water skims over the slab. Unless the creek is flowing high you can easily walk across as it's only a foot or so deep. There's a nice slide which always seems to be crowded on the north bank under a canopy of trees. Further down steam is one heck of an impressive red rock slab next to a home on the south bank. Don't get too excited. You're in somebody's back yard more or less and the creek isn't gliding over it either. You can easily work your way up to the turnaround where Valley Verde Road dead ends. Across the creek you'll see a sidewalk. This is the paved trail ending from Red Rock State Park off of Red Rock Loop Road. There's a fee to park on the other side in Red Rock State Park. It may seem pointless from over here. Keep in mind wheelchair bound folks can't push through the sand and rocks. This is just one little trip I made in the area. You can roam around in any manner and have a good time. 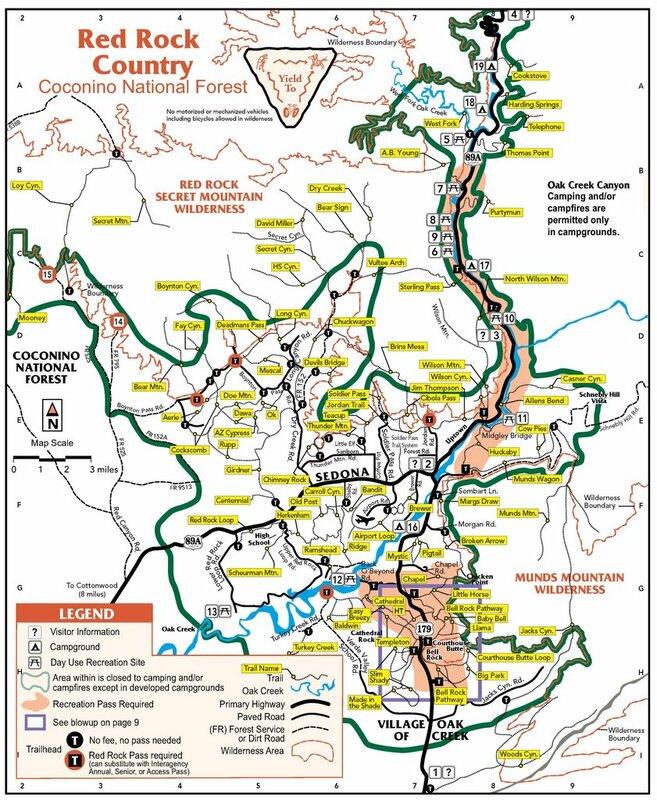 If you want a no frills, no chance of getting lost access to Red Rock Crossing: From the trailhead just follow Verde Valley Road to the end and trek upstream to Red Rock Crossing. Take I-17 north out of Phoenix to exit 298 (exit 200 is McDowell for reference). Follow 298 to the Village of Oak Creek. Turn left onto Verde Valley School Road. Follow nearly to the end. A signed parking area is on the left. Parking at the end of the road is not allowed. Verde Valley Road is dirt but easily doable in a car. One fork in the road has confused a few ( or at least the first group I sent in ) When you come to a fork in the road with signs stating 'no bridge' on the left, be sure to take the right. It's true there's no bridge on the left but they should of just posted tourist go right.